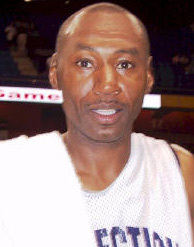 Phil Gamble was a Guard for the UConn Huskies from 1985 – 1989. He was the Most Valuable Player in the first ever UConn National Invitational Tournament Championship in 1988 and he was also named to Big East All Freshman Team in 1985-86. Phil is also a member of the UConn Basketball All Century Ballot. I had the opportunity to talk to Phil from his home in Washington, DC in January 2004 as he reflected on his basketball and life experiences. Phil grew up in a housing project in Washington, DC and it wasn’t easy being raised there. He was seven years old when he started playing basketball. He’s the youngest of nine children—five brothers and three sisters. One of Phil’s brothers, Leroy, was always playing basketball and Phil used to watch him and follow what Leroy did. They used to watch Magic Johnson, Larry Bird and James Worthy on television. In elementary school, Phil was the MVP when his team won the sixth-grade championship. He went to Jefferson Junior High School, the neighborhood middle school and didn’t make the basketball team. The coach wanted Phil to wait a year; he already had a lot of good eighth and ninth graders and didn’t want Phil or any other seventh grader on the team, which upset Phil. He played at the Boys and Girls Club and there was a guy by the name of Jay Shorter at the club who coached at a middle school in another part of town. He asked Phil if he wanted to play for him. Phil wanted to, but this meant taking two buses every day to and from school making it a pretty time-consuming commute but that didn’t stop Phil. Phil soon became the MVP at the middle school when his team won the championship. He went to Saint Anthony Catholic High School, which was a school that students had to pay to attend, but Phil was able to attend as a scholarship student. The former Georgetown University coach John Thompson used to coach at Saint Anthony’s before Phil was there. The basketball team did well. They won a championship and when Phil was a senior the team was one of the top three high schools in the country. Phil started getting recruiting letters from many universities; Georgetown, Virginia, Boston College and UConn were among them. Phil selected UConn for a couple of reasons. None of his brothers and sisters had been successful in some of their choices in life, none of them had graduated from high school or gone to college and all of them had been incarcerated. Phil’s brother advised Phil to get out of DC so he didn’t fall into the footsteps the rest of the family had. Phil was also tired of seeing his mom cry all the time over the situations of the rest of his family. His mom loved the rural area surrounding UConn, and she also liked the coaches at UConn, Head Coach Dom Perno at the time and Assistant Coach Howie Dickenman. Phil decided on UConn and was very happy there. His first year he was a starter, he made the All Freshman Team and the following three years he was a starter. He did make a mistake along the way, during his sophomore year, he and his teammate Cliff Robinson got a little big headed being the star players and ended up with academic problems and had to miss 15 games, which didn’t help new Head Coach Calhoun in his first year of coaching at UConn. Phil and Cliff got back on track and during his junior year the team won its first ever NIT Championship and Phil was the MVP. The following year he was a captain on the team. Phil said he and Cliff Robinson were really good friends throughout their career at UConn. Any time anyone called out Cliff’s name, they’d get Phil and Cliff and when anyone called out Phil’s name, they’d get Cliff and Phil. Cliff has had a very successful career in the National Basketball Association and Phil has continued to watch Cliff play and follow his career and is very happy for him. As Phil talked about some memorable moments at UConn he said, “Every time we played Georgetown University was memorable (GT being in Washington, DC where Phil was from and they had recruited him), particularly a night when I hit a three-point basket from the corner that kind of clinched the game. Four of the players on the GT team went to Saint Anthony’s and played with me.” This game was also the first game Phil’s father had ever seen Phil play basketball. Phil’s brother had gone to where their father lived and turned on the television and showed Phil’s father that his son was playing basketball at UConn. Another very memorable game was being the MVP at the NIT Championship. Phil still follows UConn basketball. “I think back to where we started and where they are now and they should be proud. Coach Calhoun was building; we started the run, winning the NIT and look where they are now.” Phil remembered when Coach Calhoun came to UConn. Phil said that Coach Calhoun said, “You work hard or you have to leave. He made that point. He was firm. He turned things around. You wanted to work hard because you saw the difference, it made us better.” Phil thinks Coach Calhoun and his staff are doing a great job. The team has some awesome players. Phil wasn’t able to go to the Final Four in 1999 but he’s going this year if UConn goes to San Antonio. After Phil graduated from UConn he was invited to a basketball tryout with the Philadelphia 76ers but didn’t make the team. He went to Europe and played in Belgium, Russia, Finland and Sweden, and also played in South Korea. He came back to the states and played in the American Basketball Association League in Hazelton, PA and had a lot of fun with basketball.